What should you do if you receive a negative Google review? Google reviews can be a blessing or a curse. A five-star rating from a happy customer is always welcomed, but what do you do if your company receives a negative Google review? Is there anything you can do to protect your company’s reputation? Several months ago, I received a call from a client who had worked hard for many years to build his business. He was distraught. He had a number of positive reviews from satisfied clients on his Google local page, and that day, he received a 1 star Google review. The name and photo of the person who wrote the review were attached to the review, but my client couldn’t remember the name or the face. After searching Google for the person’s name and combing through his records, he remembered. This person had been a former client from over 5 years ago. What was more disturbing was that my client couldn’t remember any negative outcome of his business relationship with this person. He wanted to know what he could do, if he should contact this person, or if he could write to Google and ask the search engine giant to remove the review. My client has a valid concern about that negative review he received. Reviews on Google are public for anyone to read. If you search for a local business on Google, you may notice a link to Google reviews listed right along with the results in local search results. The statistics about how many people use online reviews to check out a local business before doing business with or making a purchase from are fascinating. 93% of consumers read local reviews to decide if a business is good or not. 35% always read reviews when seeking out a business near them. I am an online review reader from Amazon reviews and Google reviews to the reviews on lake houses that we have rented in the past. Those reviews have made an impact on my purchasing decision. Chances are, your customers read online reviews too. To read Google’s entire review policy, please see, Review content policies. 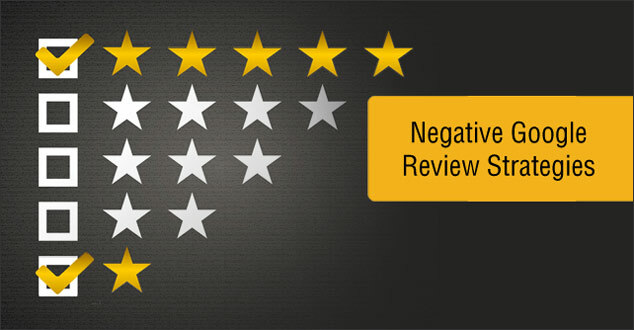 Having a strategy to combat negative reviews is the first step. Receiving a negative Google review is alarming, and it is important to know your options. There is hope. If the review violates Google’s review policy, you can flag it and report a policy violation. If you feel that the review warrants removal based on applicable laws, you can fill out Google’s form at Removing Content From Google. If you are able to and it doesn’t violate your business’ regulations, politely and professionally contact the negative reviewer. Ask how you can correct the situation. You may consider offering a refund or a discount. To dilute the impact of the negative review, encourage satisfied customers to write a positive Google review. By doing this, the positive reviews will push down and outnumber the negative. For ideas on how to encourage reviews, please see, Ways to encourage legitimate reviews. Please note: I am not an attorney and if you feel that you need to take legal action, please contact an experienced attorney. Unfortunately, in my client’s case, there weren’t many options. The review did not violate any of Google’s review guidelines. In the end, my client decided not to re-engage with the person who wrote the negative review. His action plan was to encourage legitimate reviews. Receiving a negative Google review is alarming. However, there is hope when you have a solid action plan. First, are you one who reads online reviews? Do they impact your buying decisions? Second, have you ever received a negative Google review? What action steps did you take to resolve the situation? I would love to hear your thoughts and for you to share your experience. Well done Robin. Such good research and common sense advice in this post. I’ve not had to deal with a negative review yet but I know I will. My strategy will be much as your client’s but I know it will be difficult. Thanks so much for the “extra” information about Google policies, options and additional legal advice. Great article my friend. I’m so glad to hear that you found this research and common sense advice helpful. It isn’t something that we want to have to deal with, and if it does, then it helps to have a strategy in place. Thank you for bringing some sunshine my way, my friend! Oh, Robin, you are right up my alley today! First of all, I want to send you this url because, ironically, Dex Media posted a blog about this very subject today! Now, let’s talk about what really happens when there’s a bad review. The first time we got one, I cried. Yes, I cried. I was so upset because lady was talking about me. I remembered her. She called and wanted a gift basket for a young child. We have a very limited supply of child items and she was very specific about what she wanted. I didn’t have it. I spent about 20 minutes telling her what we had, and eventually she lost her patience with me, so I referred her to someone else and she got all mad. Then she posted on Google that I wasn’t helpful and, like I said, I cried. I chose not to respond to her at all. I knew if I did I’d be adding fuel to her fire, and I decided nothing was better than getting her all mad again! Then Pamela reminded me that she’s one in a million (well, one in about 45) people who have posted reviews, and to not let it get me down. That worked just fine, but as you can tell, I have not forgotten. We then had a lady post another negative review. Her boyfriend ordered flowers and I designed them. We had another customer in the shop at the time, and he liked the flowers so much that he had me design one for him, too. The first people complained that there weren’t any roses in the arrangement (there were 6) and a bunch of other stuff. I offered to come and pick them up and replace the arrangement with a dozen red roses, but all of a sudden he didn’t know where the flowers were (he couldn’t decide if he had them, his girl friend had them at work or if she had taken them home!). So I called the man who had left with the similar arrangement and asked him to post a retort to her review, which he did. Then we had a lady complain that she had to come over in the rain to pick up her flowers! And one man, a long time ago, complained about his roses. We know he had the wrong shop because he’s not one of our customers and because Pamela’s thesis was on roses and there’s never ever ever a bad rose that leaves our shop. I did respond to him and asked him to contact us and we would be happy to replace the roses, but since he never did, then I know he posted the review on the wrong flower shop. So, in the long run, we have 4 negative reviews. The other day a lady gave us a great review and only 4 stars. I was really upset that she didn’t give us 5 stars! Why would someone say such terrific things and then only give 4 stars? I know the recommendation is to respond to negative reviews, but sometimes I don’t think so. Sometimes they are better off left alone. They’re not going to be removed or changed. It doesn’t make you feel any better to ‘vent’ or get nasty or ugly with someone who is unhappy. And I think sometimes it can cause more anxiety and negativity to respond. I also think people expect some negative comments. No, not most of them, but some of them. We’re human, after all, and we make mistakes. I don’t think Google is the place to fix issues. If there’s a problem and someone will call us, we simply take care of it. If that person goes to Google to complain, then yes, I would respond that we have taken care of him in a friendly and professional manner and we look forward to doing business with him again soon. But the fact of the matter is, we have a “do not take orders from these people” list and a “do not deliver to these people list” (albeit both lists are short!) and most professional florists have those types of lists. People who end up on those lists find they have to contact an order-taker like 1800flowers to have their orders filled. And they deserve it! OK, off my soap box for the afternoon! Don’t forget to visit Google and give us a 5 star review!! You have certainly have had an experience with Google reviews. I can imagine how heartbreaking it was each time a negative one came in. I agree with you. There are times when adding fuel to the fire by responding to a negative review is inappropriate. Each one of us has to determine what the right thing to do is. Thank you so much for sharing your experience, Tina. I appreciate it very much! Aww Robin, thank you for quoting me in your article. Review’s can be such a double-edged sword. I always tell people is you love us, tell someone else, if you have an issue with us, TELL US. Sometimes people are just pissed off and you get in their way OR you are attacked without out them even knowing you. GREAT article I need to share it! You are so welcome! Your quote has stayed with me ever since I heard you first said it. You are so right. Reviews can be such a double-edged sword. Thank you for sharing this, my friend! Great post, and you answered some questions I had, so thank you! I look at reviews a lot before I buy a product, and usually will not go forward unless there are many favorable reviews that are current. Reviews definitely impact my buying habits. My daughter, Emily, is a review queen and doesn’t spend a cent unless she’s researched thoroughly. I usually ask her to give me her opinion before I even start checking things myself. I would think the best strategy is to get many more positive reviews to make the negative one seem inconsequential. Appreciate this article, Robin, and thanks for the resources. It is great to hear that this post has answered some of your questions about Google reviews. I also read reviews before I make a decision about purchasing a product or service. I agree. The strategy of getting positive reviews to make negative reviews is a solid plan. I appreciate you stopping by, reading this, and for spreading the word! As a consumer, I do look at reviews but need to take them with a grain of salt. It is how the review is written. Sometimes in a bad review, one can read between the lines that the person writing came from a jealous point of view or just a rant. When reading reviews there is a balance between the good and bad. If I see there are a lot of good ones and one or two bad reviews, I’ll go with it. It’s a crazy world out there and some people are just complainers. I did have a crazy person giving me a bad review on my off line business, but it was apparent that it was just some spammer. I haven’t checked in a while so I’m off to check it out….Yikes! But now I have some knowledge from this post to do something about it. I understand your thoughts about looking at reviews with a grain of salt. We do need to read between the lines. There are times when I come across reviews that do appear to be unfair or just don’t make sense. You bring up a great point about the balance of good and negative reviews. It does make one wonder if every single review on a product or service is a good one. I’m sorry to hear about the review you received for your offline business. I am happy to hear that you found this helpful if you ever do run into a negative review. Thank you for stopping by, and I hope you have a wonderful week! I like this information here and will definitely use it as a reference. I have never gotten any negative reviews before and hopefully never will lol. But just in case it I do, the first thing I will do is try to resolve the issue as you mention. I use to be in Prepaid Legal (now legal shield) and the reps were taught something similar and 80% of the time the situation does not become a legal issue. Thanks for sharing Robin! Have a great week! It is great to hear that you found this information helpful and that you have never received a negative review. It does appear that there are some industries that are more vulnerable to negative reviews from unhappy clients/customers. The Internet sometimes seems like the Wild West, doesn’t it? I haven’t heard of Legal Shield and will have to check it out. Is it similar to Reputation Management? Thank you for stopping by and sharing your thoughts on negative Google reviews. Have a great week, too!